Pomodoro Fresco Pasta Salad - Made with Fresh tomatoes and herbs, this is a fresh and light pasta salad that is the perfect side for any picnic or BBQ. Major plus...NO MAYO! Howdy y'all! How was your 4th of July? It has been so dang hot here. 90 degrees is just not was we are used to in Washington! So we had a quiet day, just the two of us. BBQed for lunch, relaxed, then packed a picnic and hit the beach for some fireworks. Nice, easy, safe, and fun. 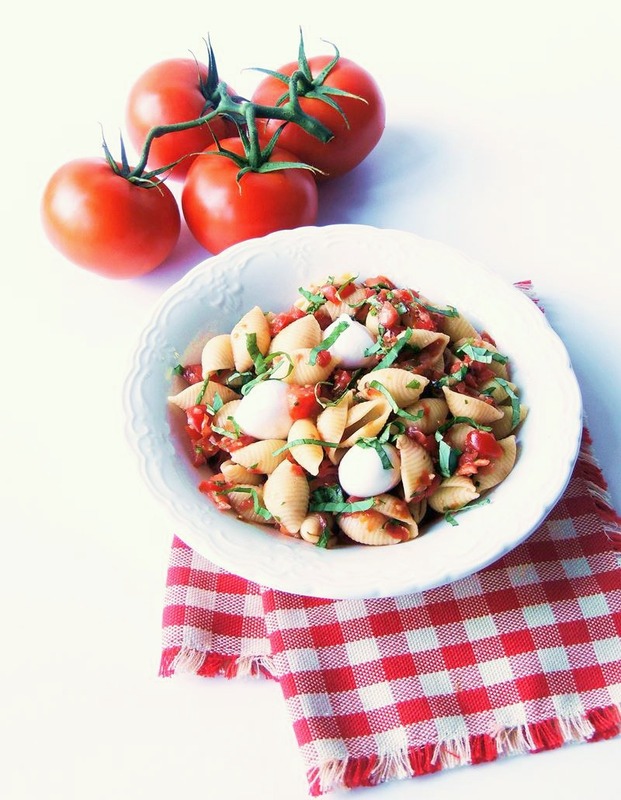 One of the things we packed for our little outing was this Fresh Tomato Pasta Salad. Folks, I am obsessed with this pasta salad right now. Seriously, I have it bad! I have gone through 3 pounds of pasta in the last couple of weeks!! It is A) super simple to make, and B) so light and tasty. Lately I am all about some fresh tomatoes. I can't seem to get enough. I have been making was seems like gallons of Salsa Fresca and putting it on everything, especially my eggs in the morning, and Pico de Gallo has been going on grilled chicken, steak, and even burgers. Do you get obsessed with seasonal fruits and veggies? I am almost as bad with corn!! Ohhh ya! This week Sunday Supper is talking "Foods that Travel Well" and I knew immediately that I had to share this with you because it has ZERO mayo in it. I did add some fresh mozzarella, but you could easily omit that if you are going to have this pasta at a picnic or BBQ and are worried about how long it might be out without refrigeration. So, in closing my darling foodies, if you are looking for a recipe for your next BBQ, picnic, or pot luck, that will travel well and not require refrigeration. PLUS has the fabulous bright taste of summer, you have found your winner, look no further, get to the store and by the ingredients ASAP. Now, pardon me as I go shove more of thise pasta salad into my snout errrr mouth. Made with Fresh tomatoes and herbs, this is a fresh and light pasta salad that is the perfect side for any picnic or BBQ. Add the tomatoes, garlic, parsley, salt, balsamic vinegar, sugar, red pepper flakes, and olive oil to a food processor and pulse until the tomatoes are rough chopped. Let sit for at least 1 hour, to let the flavors meld. Cook the pasta in a large pot of salted water, according to the package instructions. Drain the pasta. 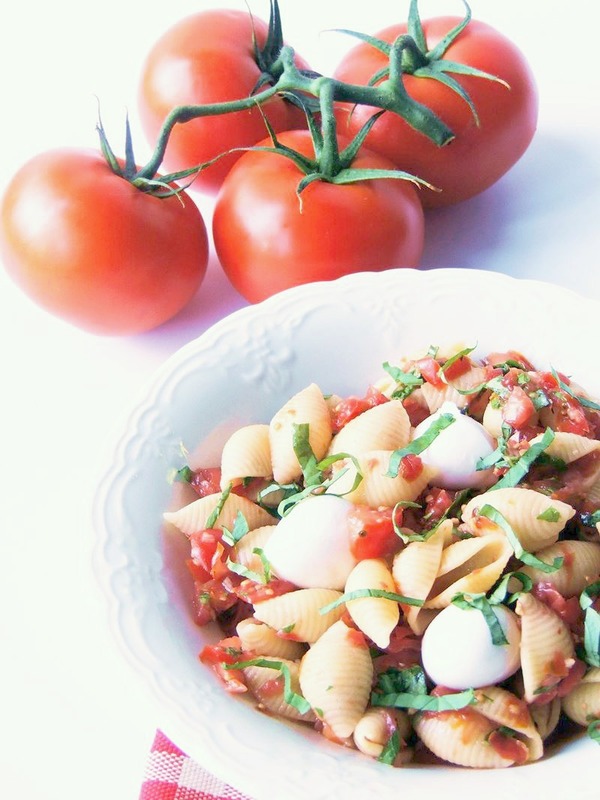 To assemble the salad, add the fresh basil and mozzarella cheese to the bowl with the tomato sauce. Stir to combine. Add the drained pasta and give it a stir to coat, and serve. Thanks to Marion from Our Life Tastes Good for hosting this awesome event!! Join the #SundaySupper conversation on twitter on Sunday! We tweet throughout the day and share recipes from all over the world. Our weekly chat starts at 7:00 pm ET. Follow the #SundaySupper hashtag and remember to include it in your tweets to join in the chat. To get more great Sunday Supper Recipes, visit our website or check out our Pinterest board. Would you like to join the Sunday Supper Movement? It’s easy. You can sign up by clicking here: Sunday Supper Movement. Would you like to join the Sunday Supper Movement? It’s easy. You can sign up by clicking here: Sunday Supper Movement. Thanks Marion. We love that it is fresh too. No heavy mayo dressing! Such a great summer pasta salad. I can almost taste the fresh sauce of tomatoes and herbs. There are some fabulous tomatoes in season right now. A salad like this is a perfect way to use them. What an amazing looking salad, sure wish I had that right now!! Thanks Tara! I have some in my fridge right now :) come on over, I will share. Now this sounds like my kind of summer pasta salad! This sounds very addicting and wonderful! Pasta salad is one of my favorite summer foods. This sounds perfect! I can see why you are so enamored with this salad! I adore everything about it!!! Thanks Liz. I am kinda addicted to tomatoes right now!! What a tasty simple salad! Delicious! I can't wait for our tomatoes now! Sounds like the 4th of July was perfect. I hate the 90's also. This salad looks like a perfect picnic salad!